Donkey Kong Land is basically what you would get if you photocopied Donkey Kong Country onto a Post-It Note. 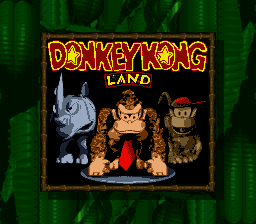 Perhaps taking a cue from Donkey Kong, this game's internal name is DONKEY KONG LAND 95. Two tracks are unused in the game. Thanks to composer Graeme Norgate's website, we know exactly what they were intended for. Thanks! The tracks can be heard in-game with the GameShark code 01xx9FC1, or Game Genie codes ? ?8-3EF-E62 + 9F8-40F-E6A + C18-41F-6EA and the proper hex values mentioned below. The King K. Rool battle was supposed to have its own unique theme, but the final game uses the generic boss music. This has a hexadecimal identifier of 12. Intended for the Skyscraper levels. Those levels use the "Building Site" theme instead. This has a hexadecimal identifier of 0F. The string PFLOYD (an obvious reference to the British prog rock band Pink Floyd, who would disband just a year after the game's release) exists in both the English and Japanese ROMs at offset 6F7A. This is used for save data integrity, and this same string needs to be present at AA00, AA40, and AA80 in RAM for the three save files to be functional (along with two checksums). If this string is not present in one of these files (even if the two checksums succeed), the corresponding file will be erased. Naturally, the PFLOYD string is never visible in the game. There is a triple-tiered tree top near the upper mid area. While it is possible to reach it, the camera will not scroll high enough to see anything without hacking. The top two tiers are non-solid. There is a gloop swimming around just under the map near the right side. It can only be seen by hacking the camera. There is a fangfish swimming around inside a reef at the upper mid area. While it is possible to see it, there is no way to access the area that it is in without hacking. Donkey Kong Land's main programmer, Paul Machacek, is credited thoroughly throughout the ROM. An unused sprite of Chomps Jr. being defeated exists in this game. In Donkey Kong Country, it was possible to defeat this enemy using Enguarde, but Enguarde is not present in Donkey Kong Land, making Chomps Jr. impossible to defeat here. Donkey Kong Land is titled Super Donkey Kong GB in Japan. The title screen and the intro screen with the Rareware logo were changed accordingly. Besides the name change, the unregistered trademark symbol was changed into a registered trademark symbol. In the International version, when beating a level, the KONG letters only flash on the screen if all four of them have been collected. If the Kongs are missing at least one, the letters will not flash; instead, whatever sprites that were on the screen stay there until the fanfare music is finished. In the Japanese version, the collected KONG letters flash on the screen even if one or more is missing—as long as least one is collected. Because the game is locked in Game Boy mode, the Super Game Boy borders are inaccessible.